I’m giving a talk next month at a graduate history conference on my Topsfield project from two intertwined perspectives: the research journey itself and how I shared the research journey in the presentation to the THS. The conference is being held simultaneously with a separate conference on establishing a field called “History Communicators” and the ending of my talk is my statement on what I think a History Communicator ought to do. I will not have much time to expand on that so I’m adding some additional thoughts here. Thinking about Science Communicators (which is the original analogy used when the idea of “History Communicator” was proposed), they start with a built-in base of a public taught the “scientific method” as school children for probably a century. Now that science is under political attack, the “Science Communicators” devote much of their communication to explaining more about the scientific process: that theoretical disagreement is acceptable, even desirable, and there are standards by which competing theories are judged, that scientific research for its own sake is critical to new discoveries, that free and open communication between scientists is also critical to the scientific process. History Communicators, on the other hand, seem to spend their time countering “bad history”, that is misreadings of the facts, cherry-picked facts and falsification of the facts. That’s not wrong to do, of course, but it continues the assumption that “history work” is a process of fact discovery. In my conference talk, I portray history work as a process of collective construction and I believe historians agree with me. The problem is, while there is general public acknowledgement that doing scientific work requires specialized knowledge and training, no such acknowledgement exists for doing history work. I’m not arguing against independent historical research nor arguing that the academy should have a lock on anointing who is an historian. Natural scientists such as ornithologists and astronomers rely on the work of “amateurs”. I would venture to say, however, that amateur birdwatchers are well-versed in avian biology and hobby astronomers have a good understanding of the theory of general relativity. I’m sure both groups adhere to methodological standards because they want their work to be accepted within the greater field. I am arguing that independent historical researchers or anyone who writes about history should know something about the standards of the history field and how history work is done. Good ones do and academic historians gratefully cite their work. Someone like Bill O’Reilly can publish a series of “history” books that are sheer arguments for his political beliefs and they are best-sellers. The public seems to believe that anyone can do reputable history. I argue it is because the public views history as simply discovering facts, as if they were pebbles lying around waiting to be picked up. Historical interpretation is viewed as a political activity and, since “everyone is entitled to an opinion,” everyone is entitled to say what he or she thinks is historically true. The scientific process is under attack and Science Communicators are speaking up in defense. The historical process has been under attack for much longer. History Communicators need to defend it as well. They need to show how we construct interpretation according to certain standards and logical argument, how disagreement over interpretation is not just conflicting opinions and to reveal the biases of those who hide their political opinions behind a false front they call history. 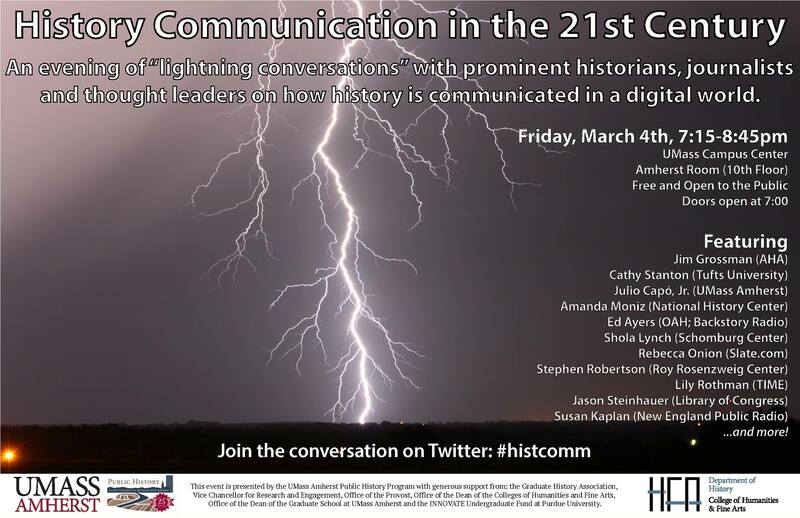 This is the poster for the History Communicator conference’s public evening.